Cosmetic dermal fillers are used by women and men alike to treat the appearance of fine lines and wrinkles, plump up the lips, define hollow areas of the face and restore volume to the skin. Juvederm is popular filler that can reverse or minimize some of the signs of aging we wear on our faces, such as wrinkles and fine lines. Juvederm is a sterile gel made from hyaluronic acid. Like most cosmetic dermal fillers, Juvederm is approved by the FDA and Health Canada to treat the signs of aging, boost collagen production (the protein responsible for giving our skin strength and elasticity), and restore volume to the skin that has been lost due to age, pollution and lifestyle factors (smoking, bad diet, prolonged sun exposure, etc.). The hyaluronic acid found in Juvederm is created from a synthetic process and mimics the hyaluronic acid that is naturally found in our skin. In fact, 40% of our dermis (the deeper skin layer) is made up of hyaluronic acid, while the rest is made up of collagen. As we age, collagen production slows down, which is another reason why people choose Juvederm – because it prompts the body to create more of it. Because muscle movement breaks down cosmetic dermal fillers, even when they’re made with substances that naturally occur in the body, the area in which the fillers are injected will determine how long they last. When Juvederm is injected into the lips or mouth area where there is ample muscle movement, the product will only last about four months (six if you aren’t a big talker). On the contrary, when cosmetic dermal fillers are injected in the area under the eyes, Juvederm may last up to nine months to one year. The area under the eyes does have some muscle movement (like when we squint), but it is relatively moderate compared to the lips and the areas that surround them. 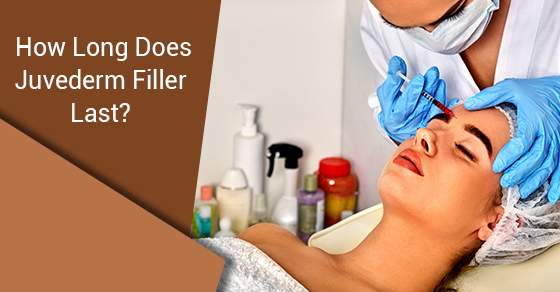 How Often Can Cosmetic Dermal Fillers Be Injected? Juvederm and other cosmetic dermal fillers can be injected again as soon as you notice their effects wearing off. Unless you have an allergic reaction to the product, which is rare since Juvederm is made with materials found in our bodies, you can have the procedure done repeatedly every year. Please contact us for more information about cosmetic dermal fillers and erasing the signs of aging.